Yesterday I went to Albany, NY for the annual Tulip Festival. It wasn’t anything intrinsic to this festival that drew me (though I do like tulips), but rather the fact that there were a couple of stages of entertainment, and the headlining act was They Might Be Giants. Those who know me know that I’m a big fan of the band. In the 15 years I’ve been a fan, this is the 7th concert of theirs I’ve been to (if you count appearances in music stores then the count is actually 9). I actually arrived in the mid-afternoon and caught the band that was on before them: OK Go. I saw OK Go once before, opening for TMBG, in fact, back before they had any singles on the radio. OK Go were not, at first, as amusing as I remembered them from before. Their songs were enjoyable, and I had to like that they did a cover of Don’t Bring Me Down, by ELO. They finished with a great “encore.” While their equipment was being struck, the lead singer talked about the ancient history of MTV, when music videos were played. The band then proceded to do a “video” on stage for their new single. The song was played from a CD and they lip-synched and danced, with silly choreography, slow-motion martial arts moves, and the like. Most of that set there was a guy standing just in front of me, smoking and drinking what must have been at least his 4th and 5th beers. I say this because he didn’t seem to be able to keep from stumbling into me, even before the music had started. He also at one point turned to me and declared “That’s rockin’, man!” and wanted me to give him a high five/hand clasp or something. In other words, he was just generally being Annoying Drunk Boy. A bit later, I noticed that ADB had a caterpillar walking on his shirt. I decided not to warn him, and watched amusedly while it crawled onto his neck. It took him a while to notice it there, and when he did, he knocked it down the back of his shirt while trying to get it off. At that point, I just felt sorry for the caterpillar. Not sure what happened to it after that. Once the OK Go set finished, some of the crowd cleared away, and I was able to get a spot right behind the front row of people (and away from ADB and his friends). It was a nice, close spot from which to see John and John* (not to mention Dan, Danny, and Marty**) as they took the stage. I memorized the setlist as they played, assigning one word to each song, so that I could write it down later as I didn’t have pen or paper with me. Those last 3 songs were the planned encore. John Flansburgh prefaced Number 3 by saying that he had once considered taking out references to the president in the song, as it was written in the Reagan era and he figured we would only have better presidents after that. He has changed his mind in the current presidency. Speaking of that, apparently the heat and light of the sun are caused by the nuclear reactions between a failed foreign policy, a failed domestic policy, and a failed presidency. Other highlights: the confetti cannon that they have used in the past for the song James K. Polk is now a double cannon, and it was used in 2 songs other than that one (plus it was accidentally set off backstage early on). For the song Drink, Flans had the audience members pretend we were doing an intervention. So, every time Flans said the word “drink,” we were to yell “No, wait!” Finally, in the song New York City, he sang about being 3 hours from NYC (the normal lyric being 3 days). I was looking through the stats for my website today, and was amused to discover a couple of things. First, one of the referring sites to my site was the blog of a somewhat famous person. It turned out that, in comments about Mooney going to the midwest to speak, someone remarking on Michigan made a reference to using one’s hand as a map, and linked to this image, which I created a few years ago. Third, though this might not be related to that image, for multiple months other referring sites were image searches. 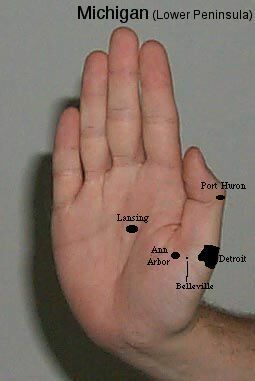 I tried entering “Michigan hand map” on google image search, and I was hit #16. Strangely, if you do just “Michigan hand,” there seem to be more actual hands, but mine isn’t in there. At least, it isn’t in the first 200 hits. Actually, I found out today about something that will occur on my birthday. As you might know, Tom DeLay will not be running for reelection to the US House of Representatives. It appears now that he has further decided to resign from his House seat without finishing his term. His last day on the job will be June 9 – the same day that I turn 34. Gosh, and I didn’t get him anything! Of course, the gift is not as impressive as it sounds.Â I don’t think he’s going to stray too far from American Politics, just because he won’t be in elective office himself. Last night I went contra dancing for the first time ever. For those who aren’t familiar, it’s essentially old English/Gaelic country dancing, and has nothing to do with the Contras. So, I had square danced before, and thus knew a little of what to expect. However, I only square danced once, and that was in sixth grade (22 years ago! ), so I was a little out of practice. I did okay, though, especially because this is a social interaction where the experienced folks are very helpful to the newbies (kind of the opposite of the internet). It was great fun, and definitely something I would like to do again. I’m a little sorry I didn’t get around to trying it sooner, as I’ve known of contra dance for years. The place we went was the Guiding Star Grange in Greenfield, MA. It was a very amiable and adaptable bunch, because, soon after we arrived, the power went out. The caller had the crowd be extra quiet, so the musicians could be heard without amplification, and two more contra dances (plus a waltzing interlude) happened by the emergency battery lights (and a few flashlights people had). Kind of a big dance weekend, as we also went to 2 dance performances. It was several weeks in the making, but I have converted the Sadlibs to be a blog of their own. I will no longer be posting here when I have a new Sadlib up, because that blog will have its own RSS feed etc. Also, now that Sadlibs are in blog form, please feel free to use the comments section of each Lib entry to post your resulting story.